Tbilisi, Ilia Zdanevich’s hometown, became a haven for artists of all stripes during the Russian Civil War. In this multi-lingual environment where feuds among artistic schools had been suspended, Zdanevich worked out the principles of “mature” zaum and a corresponding approach to book design. 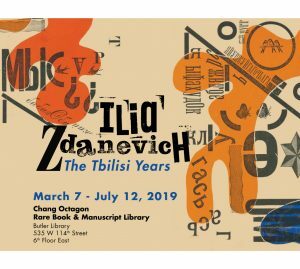 This exhibition, curated by Thomas J. Kitson, begins before the First World War with Zdanevich’s apprenticeship as a propagandist for the Larionov group in competition with Futurist rivals and proceeds through masterworks he designed and typeset as a founding member of 41°. We include a selection of works by his brother and collaborator, Kirill, and a display of interconnected items associated with other poets, composers, and visual artists who frequented the Fantastic Tavern, center of Tbilisi artistic life between 1917 and 1920. 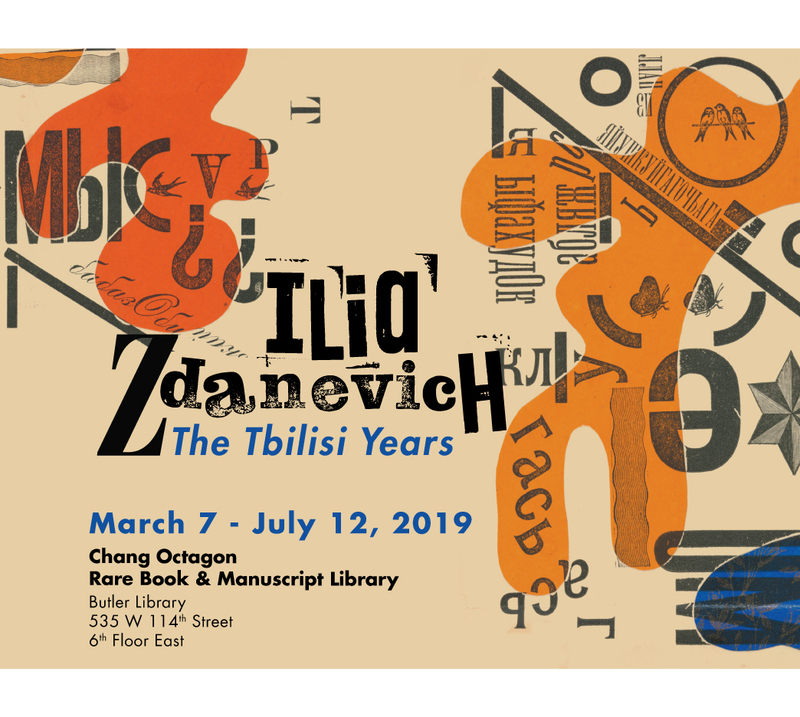 The exhibition is part of “Displacement and Display: The Ongoing Revolutions of Ilia Zdanevich,” a Global Humanities project led by Professor Valentina Izmirlieva (Slavic Department) and sponsored by the Office of the Dean of Humanities at Columbia University. This entry was posted in Bakhmeteff Archive, Publishing, Russian & Eastern European Collections and tagged Ilia Zdanevich, Kirill Zdanevich, Russian Civil War, Tbilisi, WWI on March 15, 2019 by Kimberly Springer. This entry was posted in American History Collections, Literature Collections, Publishing, Russian & Eastern European Collections on November 15, 2018 by Columbia Rare Book & Manuscript Library. Following the introduction of lacquer-painting in the 15th century, bookbindings became a rejuvenated site for creative expression in Iran. ‘In the School of Wisdom’ presents over thirty examples, representing the diversity of the art as it developed from the late Safavid to Qajar eras and contextualizing it within a changing landscape of libraries and book culture. 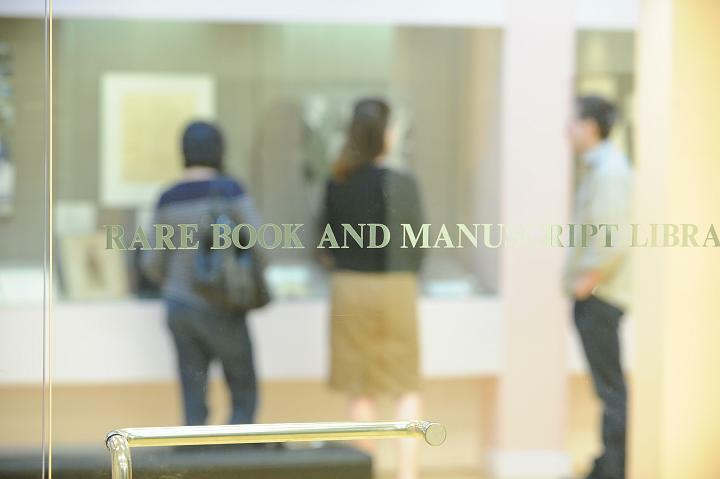 The Rare Book & Manuscript Library (RBML) is Columbia’s principal repository for primary source collections. 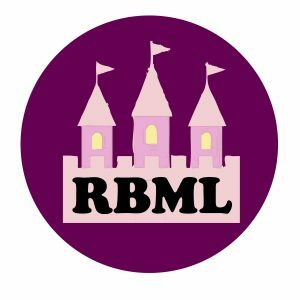 The range of collections in the RBML spans more than 4,000 years and includes rare printed works, cylinder seals, cuneiform tablets, papyri, and Coptic ostraca; medieval and renaissance manuscripts; posters; art; comics & cartoons, and oral histories. 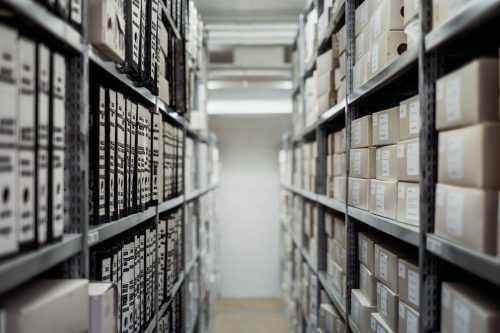 Forming the core of the collections: 500,000 printed books, 14 miles of manuscripts, personal papers, archives and records, and 10,000 (and counting) oral histories. This entry was posted in American History Collections, Bakhmeteff Archive, Columbia University Archives, Comics and Cartoons, Hebraica and Judaica, Human Rights Collections, John Jay Papers, Latino Art & Activism, Literature Collections, Medieval & Renaissance Collections, Papyri and Ostraca, Performing Arts Collections, Printing History and Book Arts, Publishing, Russian & Eastern European Collections and tagged introduction, start of academic year on September 4, 2018 by Columbia Rare Book & Manuscript Library. This entry was posted in News & Events, Publishing on January 22, 2016 by cl880. 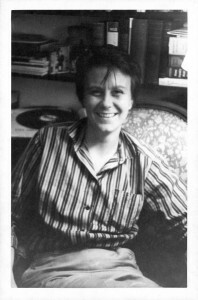 Nelle Harper Lee, photographed by friend Michael Brown in October 1957, the same month that she signed the contract with Lippincott. HarperCollins publishes Harper Lee’s novel Go Set a Watchman today, July 14, 2015. With an initial print run of 2 million copies, this is the most highly anticipated book release of the year, carefully promoted by HarperCollins since their February 3rd announcement . Go Set a Watchman’s publication has also generated advance press in the form of controversy. HarperCollins has billed the novel as a sequel to the Pulitzer prize-winning and perennially best-selling To Kill a Mockingbird. But Lee’s biographer Charles Shields asserts that Go Set a Watchman was an early draft of To Kill a Mockingbird. In The Washington Post, Neely Tucker questioned the timing of the decision to publish the novel sixty years after its composition and within months of the death of Nelle Lee’s protective older sister, Alice. Alexandra Alter and Serge Kovaleski in The New York Times have pointed out discrepancies in the narrative about GSAW‘s composition and re-discovery given by HarperCollins and Lee’s current lawyer, Tonya Carter. NPR books also reviews the debate about the novel’s genesis and the decision to publish. The papers of Nelle Harper Lee’s literary agents, Annie Laurie Williams and Maurice Crain, held by the Columbia Rare Book & Manuscript Library, have factored in these debates. 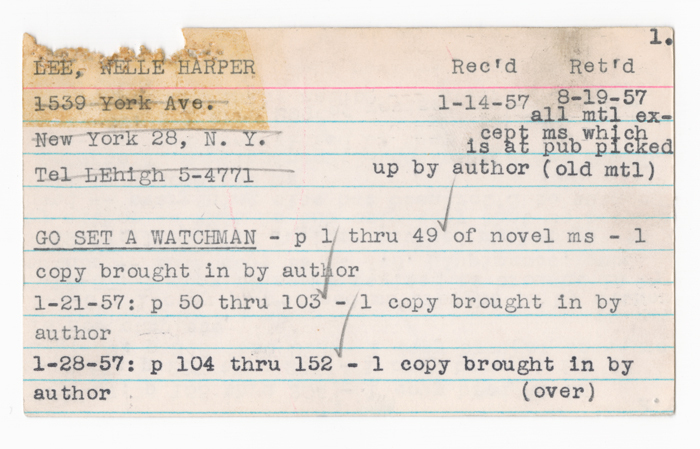 The visitor cards kept by Williams track the submission of manuscripts by agency authors and provide a detailed timeline for the creation and eventual shelving of the manuscript for Go Set a Watchman. On the series of sequentially numbered cards above, one can see that starting on January 14, 1957, Harper Lee began delivering the pages of Go Set a Watchman at a steady pace of approximately fifty pages per week until it is noted as completed on February 27, 1957. 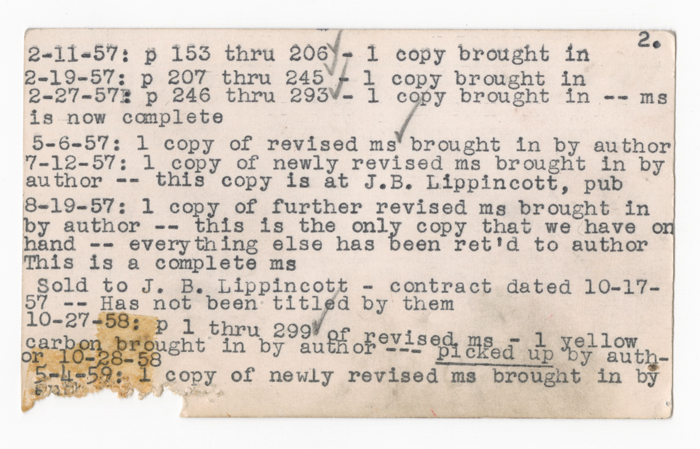 The manuscript then underwent editing, and by October 17, 1957, a fully edited manuscript was sold to J.B. Lippincott without a title, a fact corroborated by Maurice Crain’s facsimile of the contract in a contracts ledger, the first page of which is pictured below. Lee then spent two years revising the novel. 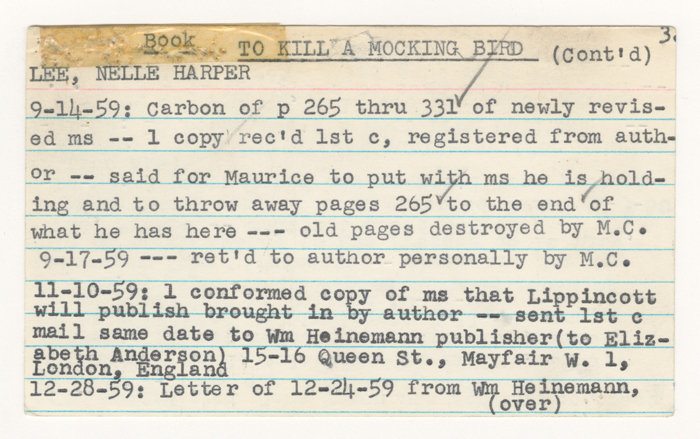 On the third of the sequential notecards pictured above (note the typed numbers in the upper-right corner of the notecards), a new title for the novel contracted by Lippincott emerges: To Kill a Mockingbird. A separate card (below) from a file that Annie Laurie Williams kept for manuscripts also illustrates the change of title. 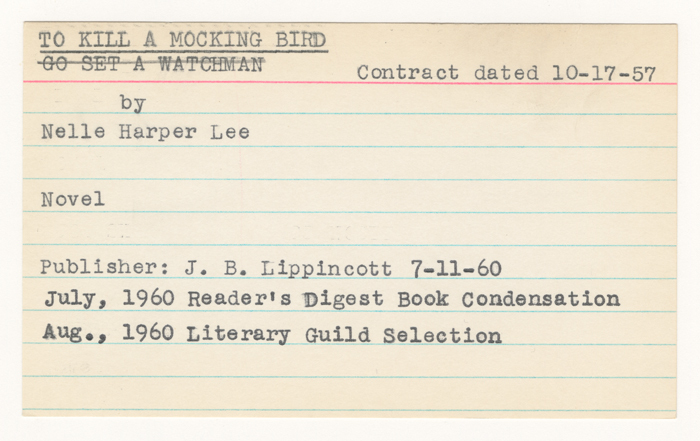 Filed under Lippincott, To Kill a Mockingbird appears above Go Set a Watchman, which has been crossed out. 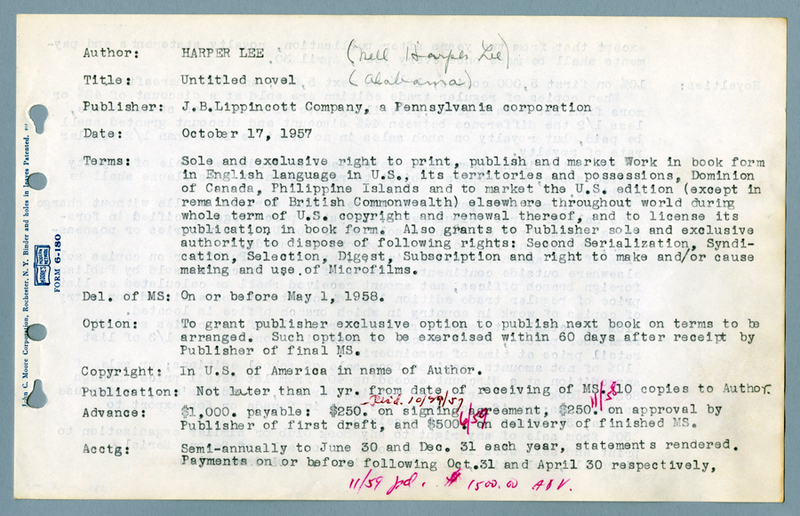 This emendation and the sequence of submissions noted in the visitor cards supports Nelle Lee’s comment that GSAW is the “parent” of TKAM, a novel set in Maycomb years after the plot of TKAM but drafted before. Annie Laurie Williams (1894-1977) was already a successful literary agent known for Hollywood successes such as Gone with the Wind (1939) by the time she and Maurice Crain teamed up as life and business partners. Together Williams and Crain handled the work of literary greats such as John Steinbeck and Nelle Harper Lee. Williams donated her and Crain’s papers to Columbia University in 1971. Nelle Lee first contacted the agents in 1956. The earliest visitor cards in the collection note that Lee first submitted short stories to her agents and that they first received her as a friend of Truman Capote. The papers of Williams and Crain show that they developed a close friendship with Lee, whom they often invited to join them at their weekend home in Connecticut. But documentation concerning Lee’s writing and revision process is scant, perhaps because so much of the discussion was conducted in person. A statement published in the WSJ yesterday by Tonja Carter, as well as Jonathan Mahler’s New York Times article focusing on Lee’s relationship to her editor at Lippincott, Tay Hohoff, suggests that there is more evidence to consider as this newly visible work changes the conversation about one of the country’s most beloved novelists. Initial reviews of Go Set a Watchman (by Michiku Kakutani in The New York Times and Mark Lawson in The Guardian) have raised questions about the diverging racial politics of the two novels, for example. Hopefully access to a second work by Harper Lee will bring more critical and scholarly attention to her writing as well. 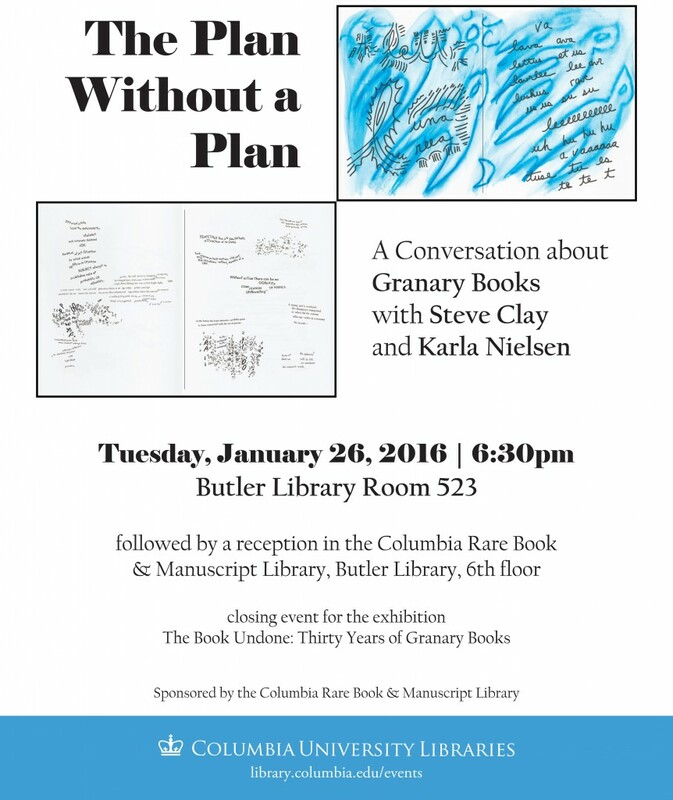 This blog post and a small exhibit of these materials currently up in the Columbia Rare Book & Manuscript Library were put together by Tom McCutchon and Karla Nielsen. This entry was posted in Literature Collections, Publishing on July 14, 2015 by Karla Nielsen. This entry was posted in News & Events, Publishing on April 7, 2015 by cl880. 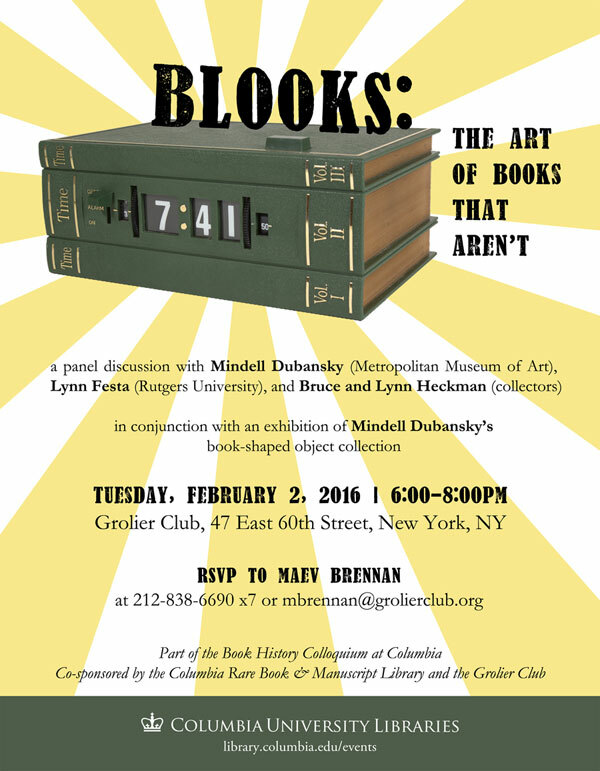 This talk addresses two major quandaries regarding the future of the (digital) scholarly book. 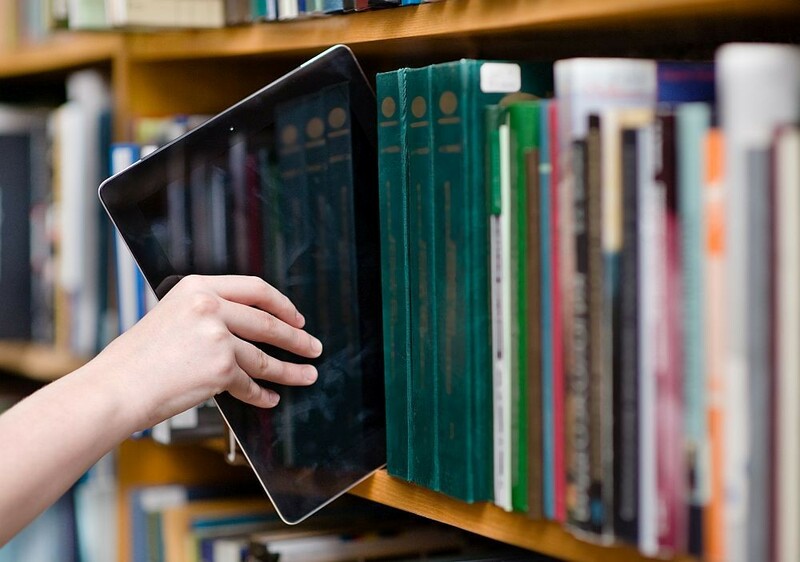 The first has to do with the concept of ‘book’ when applied to books written for the screen and read on phones by generations that have grown up with the internet and touch screen devices. 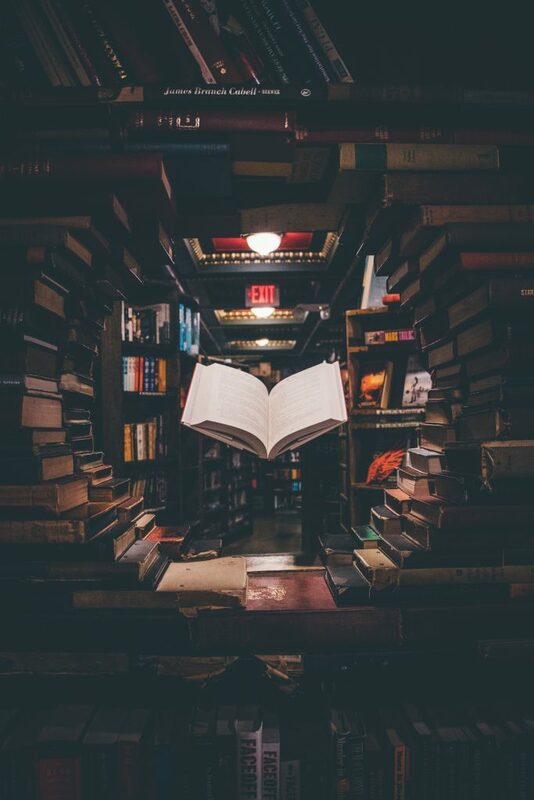 What role does a press have when ‘books’ are designed and coded by technologists, preserved on the cloud, and disseminated through social media? What implications does this have for the classroom? For academic institutions grounded in libraries? 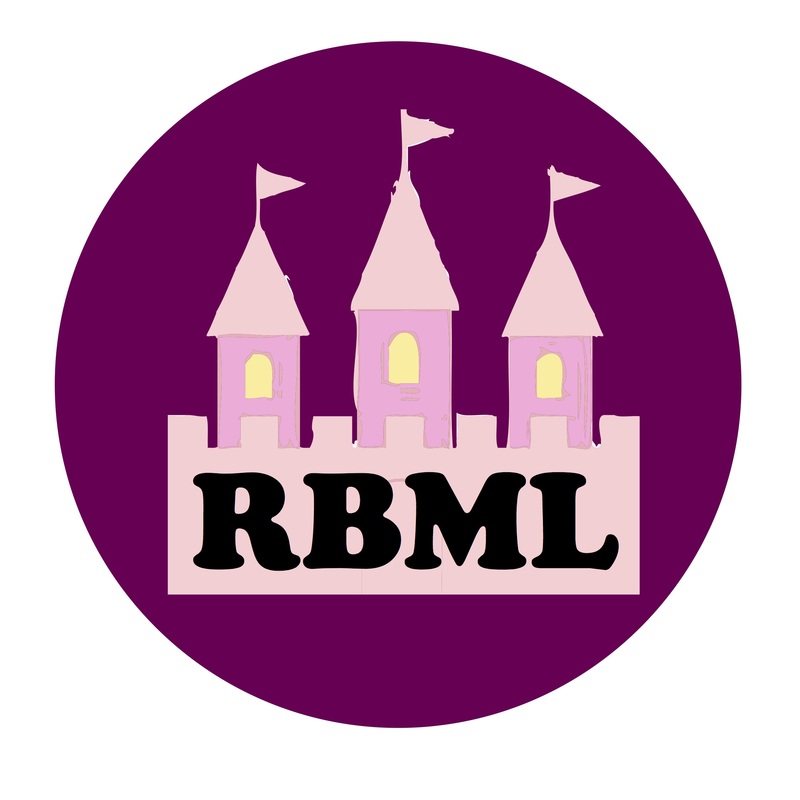 For legal and classification regimes such as copyright and ISBNs? The second question has to do with the changing understanding of scholarship itself. 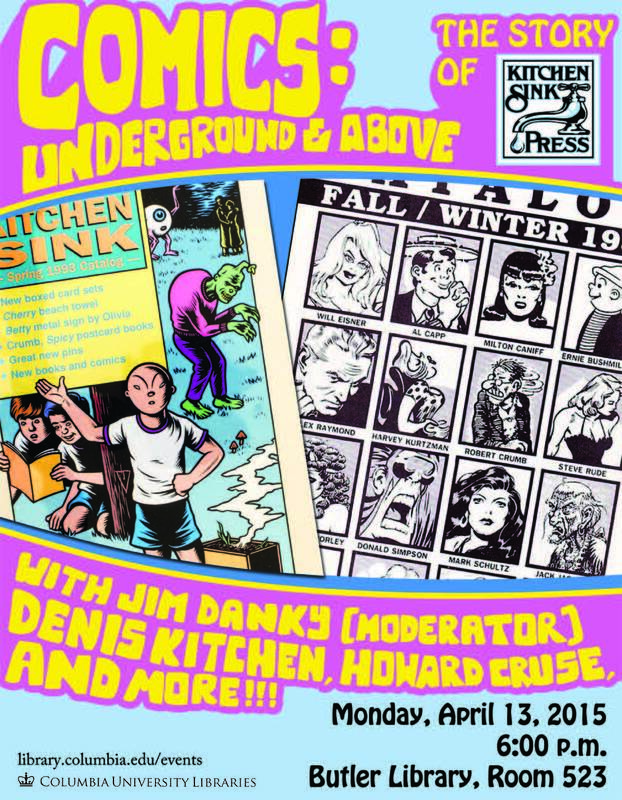 The speakers will provide examples from the digital books they have created to address these issues. Diana Taylor is University Professor and Professor of Performance Studies and Spanish at NYU. She is the author of the award-winning Theatre of Crisis: Drama and Politics in Latin America (1991), Disappearing Acts: Spectacles of Gender and Nationalism in Argentina’s ‘Dirty War’ (1997), The Archive and the Repertoire: Performing Cultural Memory in the Americas (Duke University Press, 2003), which won the Outstanding Book from the Association of Theatre in Higher Education, and the Katherine Singer Kovacs Prize for Best Book in Latin American and Hispanic Studies from the Modern Language Association. She has received many awards and fellowships, including the Guggenheim Fellowship in 2005, Phi Beta Kappa Visiting Scholar award (2012-13), and the ACLS Digital Innovation Fellowship (2013-2014). She is founding director of the Hemispheric Institute of Performance and Politics. Alexei Taylor is an interactive designer of screen-based publishing and authoring systems. As the co-founder of TypeFold, a company that develops digital publications and software, Taylor’s focus is on a variety of authoring systems for classrooms, e-books, interactive journals, and virtual museums that utilize maps, augmented reality, streaming data and community. He has taught graduate and under graduate classes in design and technology and uses this experience to challenge the role of interactivity, collaboration and media in pedagogy. Taylor holds an M.P.S from NYU’s Interactive Telecommunications Program. This entry was posted in News & Events, Publishing on February 18, 2015 by cl880.